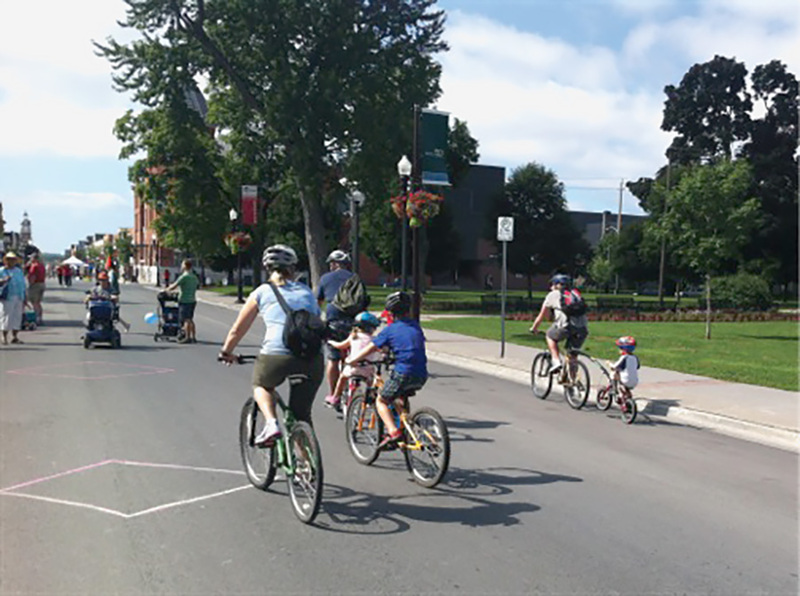 Peterborough Pulse, the city’s annual Open Streets event, turns George Street into a car-free corridor that quickly fills with people biking, strolling, dancing, and getting to know one-another. Open streets offer cyclists a unique opportunity. They can experience the street, and the neighbourhoods it passes through, in a space designated for them alone. Away from the noise, pollution, and speed of motor vehicles that often dominate the space. Open streets also offer a chance for cyclists to meet, discuss, and play. P-BAC has been an active member of the Organizing Committee since the pilot year in 2015. P-BAC works with community partners to bring bike-related activities and amenities to Pulse. Bike fun has included bike playgrounds, pop-up bike lanes, bike valet parking, cyclist surveys, and more. Grab your bike and join us on George Street.